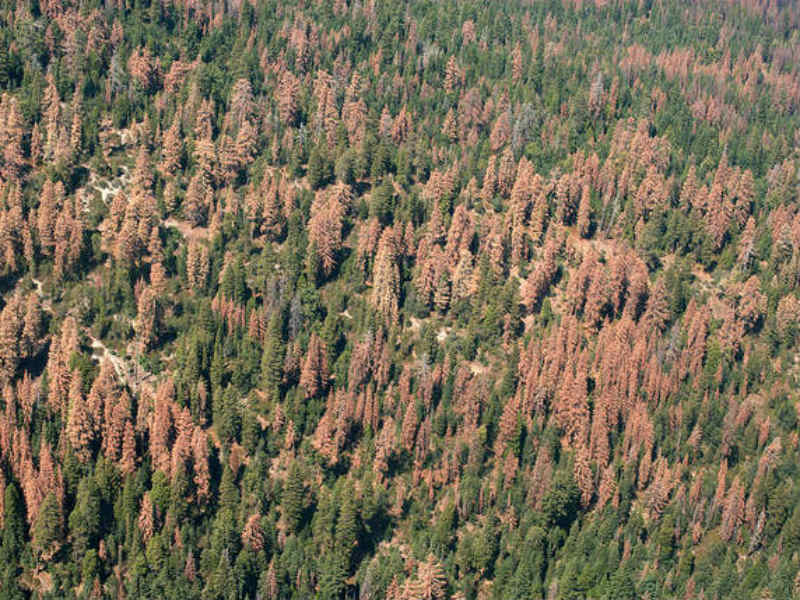 Last year, more than 18 million new trees died in California's forests. That brings the number to 147 million since 2010, according to a new survey from Cal Fire and the U.S. Forest Service. The Forest Service warned Monday that dead trees continue to pose a hazard to people and infrastructure, especially in the central and southern Sierra Nevada regions, where they can serve as fuel for wildfires. Officials declared an end to the drought in 2017 after a wet winter that drenched the state. But California has seen some of its worst wildfires in recorded history since. Cal Fire Director Thom Porter says the slower rate of die-off is encouraging, although the “18 million trees are an indication that the forests of California are still under significant stress.” He says the agency will continue to increase “the pace and scale” of fuel-reduction practices. Over the past two years, some 1.5 million dead trees were cut down along roads, trails and homes to protect the public. The remaining dead trees act like kindling when a fire ignites, says Randy Moore, the regional forester for the Pacific Southwest Region of the Forest Service. There are about four billion trees on the landscape in California, and Moore says that, while this may not seem like a lot, “it has a huge effect on water supply." In Gov. Gavin Newsom's proposed budget, he plans to invest $1 billion into managing the state's forests, over five years, to help prevent wildfires. The funds will be used for new firefighters and forest-management tactics like prescribed burns and forest-thinning. Last year, 313,000 acres of forest were cleaned-up on federal, state and private land. That includes 63,000 acres of prescribed burns, which is the largest amount since the National Fire Plan was put in place in 2001.